In this helpful, research-based look at six key aspects of healthy living, a former CEO of nutrition retailer General Nutrition Centers (GNC) shares the science behind the changes that helped him recover from the serious medical condition Multiple Chemical Sensitivities and reviews ways for individuals to improve their own health. 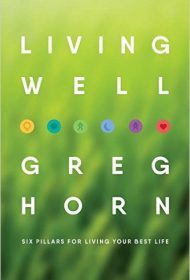 Author Greg Horn begins with a chapter titled “Thinking Well” that discusses choosing health goals such as weight loss, making time to achieve those goals, and benefiting from a “digital detox” to avoid the distraction of cell phones and social media. Other chapters are titled “Moving Well” (detailing the benefits of walking and swimming and the risks of a sedentary lifestyle); “Sleeping Well,” (about sleep’s importance in avoiding weight gain and for stress release); “Hosting Well” (how ingestion of beneficial microbial supplements protect the gastrointestinal system and balance hormones); and “Staying Well” (the importance of eating organically, avoiding toxic metals, etc.). Not surprisingly, Horn mainly focuses on nutrition in “Eating Well.” “When did eating well get so complicated?” the author asks as he helps readers deconstruct healthy nutrition. He points out that studies show followers of the Mediterranean diet—which relies on legumes, olive oil, whole grains, fruits, vegetables and fish—have a significant reduction in the risk of heart attack, stroke, diabetes and excess weight. Horn also shares research about the health hazards of the typical American diet, typically food high in fats and sugar and low in healthy vegetables, fruits and nuts, and discusses the advantages of eating organically, as well as consuming some supplements. Horn believes the healthy choices that helped him recover from Multiple Chemical Sensitivities can also help individuals without the condition. His own health experience, coupled with access to top nutrition experts and medical research, provide a solid foundation for this overview of clinically proven interventions, and the author’s lively, easy-to-understand and well-written recommendations will be beneficial to readers looking to achieve their own wellness goals.